was actually my grandpa’s saying. who can only accept it part time. It’s fitting that Ellen Hopkins’ newest novel-in-verse for adults, Collateral, shared its release day, November 6, with the United States election day. It’s both timely in its exploration of the effects at home of the country’s long-time military involvement in Afghanistan and Iraq and in that Collateral also touches on a number of other current issues in this country, creating a heavy-handed, though still beautifully written, snapshot of American life that’s intertwined with the modern military. Written in free verse, Collateral is mostly told from San Diego student Ashely’s point-of-view. She meets and falls in love with a Marine, Cole, a guy from rural Wyoming whom she is shocked to discover isn’t what she thought of as the stereotype of a military man. Cole writes poetry, he’s smart, he’s funny. Their relationship is intense, and Collateral spans five years and four of Cole’s deployments. The title of the book—Collateral—demonstrates the main theme of the book: collateral damage. Or to put it more explicitly, the unintended costs of war, in this case meaning the people left behind at home. Ashley is very much an idealist, she sees the world in good versus bad, so dating a Marine explodes her universe, pushing her out of her comfort zone. The early chapters in which Ashley comes to terms with the knowledge that people in “The Military” are real people and not simply part of a monolithic culture are the strongest of the story. Interspersed with verse from Ashley’s perspective (there are also poems written by Ashley sprinkled in the text) are poems written by Cole, which provide a glimpse into what his life in the military is like. These poems were the most moving for me. They illustrate how, despite his best efforts, things are not all right for Cole. He loves Ashley and misses her deeply, but he also feels deeply feels his commitment to his career in the military, despite the trauma of his experiences. Also strong is a subplot about Ashley’s close childhood friend, Darian, who’s military husband is severely injured. Darian has been unfaithful to her husband during his deployment, and Ashley has helped her carry on this subterfuge. The decision Darian faces is an unimaginable one, and even though Darian’s actions earlier in Collateral were wrong, it is difficult not to feeling sympathetic toward her. Unfortunately, I cannot say the same for Ashley’s character development. Ashley is portrayed as smart, creative and sensitive. And yet, her actions belied none of this. Instead, she is judgmental, selfish and immature. While I generally do not take issue with difficult characters—and often enjoy unlikable narrators—in Collateral, there’s such a striking difference between what I’m supposed to believe about Ashley and who she really is that I found myself challenged to care about her journey at all. For example, at one point Cole is granted leave and plans to visit his mother in Wyoming. Ashley becomes enraged that he didn’t first think to spend the holidays with her, at her family’s home in Lodi, California. She never wants to share Cole, not with his family, not with his friends and certainly not with the military. And I think this scene served to prove what is much of the point of the book, that when a person is in a relationship with someone in the military, they never get to keep them all to themselves. However, that’s also called being a grown up. In the grown up world, we don’t own people, even those we love the most. Compromise is one of the lessons most people learn as they enter adulthood. Cole’s ability to compromise in a normal manner is limited due to his job, but Ashley’s myopic point-of-view cannot see that. She really believes that she should be the center of her boyfriend’s world. I suppose that’s not an unusual perspective for someone in their early twenties, but nevertheless, she doesn’t grow beyond this, despite the deeply difficult journey she is on throughout Collateral. Ultimately, Ashley is unwilling to make a decision about what direction she wants for her relationship with Cole until her hand is forced and a new man (her professor, continuing the oh-so-frustrating trend of student-teacher relationships in novels) piques her interest. Furthermore, Collateral is far too heavy-handed with its political commentary. A book tackling war naturally has an undertone of politics, because the two are intrinsically linked. However, Collateral crossed a line for me into social commentary because the characters and viewpoints were so dichotomous. hopefully extricate us from the quagmire. Additionally, I realize that verse is Hopkins’ signature style—and I adore verse novels—I was never convinced that this story was best told in verse. The sparse rhythm of the verse is very immediate and intense, which meant that potential nuance was lost. I would have loved to have read more detail about Ashley’s thoughts and more subtleties of conversation. Because the novel is so political, the verse format at times felt more like a lecture than a story. Dad asked. Cole answered. Mom squirmed. but it kept coming back to Iraq. that awful woman? What about her? remained low, emotion ran high. We all skipped dessert that night. 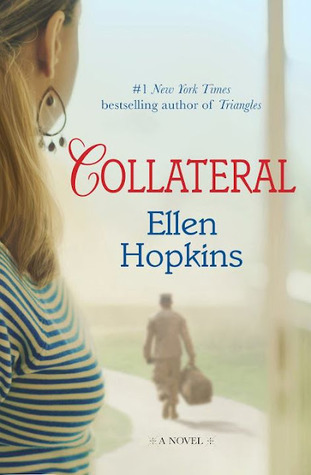 However, I am certainly many people will adore Ellen Hopkins’ Collateral. I can imagine Sandra reading this novel in verse and nodding in her head in agreement quite a bit. And it’s yet another book focussed on the very-trendy early-twenties demographic and will likely appear on many “new adult” lists. More importantly, Collateral brings an important subject—the challenges faced by loved ones when soliders deploy—to light. Yet, I prefer a lighter touch which invites the reader to draw their own conclusions; as a result, despite its promising premise, Collateral left me frustrated and disappointed. FNL Character Rating: The version of Lyla we all despise, who believes that everything in her life should fall into place because she’s Lyla Garrity. Disclosure: Received for review from the publisher via Edelweiss.